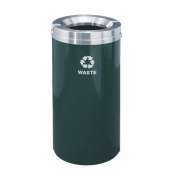 Outdoor Recycling Bins: Shop From Our Great Selection! How do you keep public outdoor spaces clean? Outdoor recycling bins encourage everyone to dispose of waste properly so your playgrounds, courtyards and parks look beautiful in any weather. Make sure you choose a design that is the right size for your needs and fits in with your other outdoor furniture. 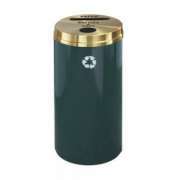 Outdoor recycling containers are essential for any school or office that cares about the environment. People aren’t going to walk around looking for a place for bottles and cans, but if proper recycle bins are available on hand they are much more likely to put things in the right place rather than taking the easy way out and just throwing everything in the trash. 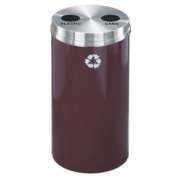 Which recycling bins can go outside? 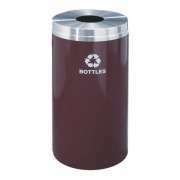 Not all waste receptacles can be used as outdoor recycling bins, you need to make sure that the model you choose is made of a material that can withstand the elements. When you have models with all-weather construction, you don’t need to worry about bins getting damaged from rain, snow or ice. Hertz Furniture also offers fire-safe construction for extra safety and durability no matter what happens. What can go in an outdoor recycling bin? What goes in an outdoor recycle bin depends on what the recycling rules are in your area. Every city and county has its own unique requirements, so it’s a good idea to check exactly what they are before you start putting things in recycling bins. Once you know which types of products are eligible, you can choose a design that accommodates all of the possibilities. Many places require recycling to be sorted so that is another thing to think about. What is the easiest way to sort recycling? You always have the option of sorting things by hand once the bags in your outdoor recycling containers are full, but it saves a lot of time if you don’t have to. You can put separate bins for each category of items next to each other or even get one recycling container with multiple slots. Clear labeling will ensure that people don’t get confused about what goes where. With either of these options, you will save time and energy because everything will be pre-sorted so all you have to do is remove the bags and you are ready to go. 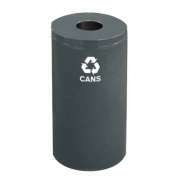 Can you customize recycling bins? Aside from choosing the best size and design for your outdoor recycling bin, you can also decide exactly what kind of recyclables it will hold. One clear way to ensure that the right kinds of items go inside is by choosing a top with a slot of an appropriate size and shape. Another helpful idea is to have a clear printed label on the front and top of the bin which say what is supposed to go inside. 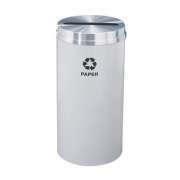 You can even get a recycling bin with a custom logo to make it clear that your company or school really cares about the environment.